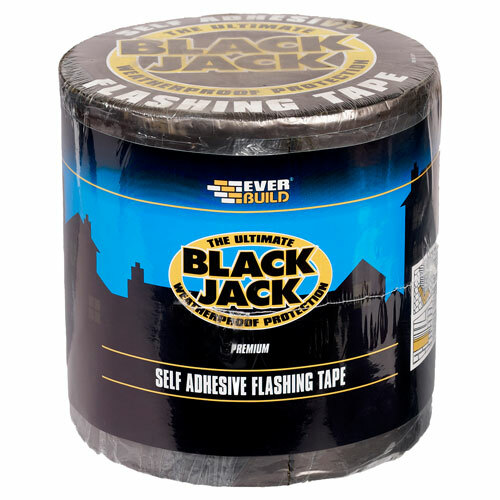 Everbuild® Black Jack® flashing tape is a stron self adhesive flashing tape comprising of an aluminium foil and bitumen rubber adhesive. The adhesive forms a weatherproof seal simply by pressing the tape into place by hand. The application is extremely easy and should be carried out by hand. The flashing tape has a very strong self adhesive backing which can be applied to most substrates. It has excelent adhesion. All surfaces must be dry, sound and free from dust oil and grease. Remove ALL loose material by scraper or wire brush. It is recommended that porous surfaces such as concrete or brick should be primed using Black Jack® primer. Cut the flashing tape to the required length, peel back approx. 50mm of the release liner and place the tape into position. Continue removing the release liner whilst firmly placing the tape to avoid unnecessary creasing. Ensure intimate contact and that no air is trapped. Using a small roller to ensure that all edges and overlaps are sealed properly. Overlaps should be a minium of 25mm. In cold weather or storage conditions adhesion may be reduced. Bring up to temperature with a hot air blower.